Friends are great, aren’t they? That was my thought for the evening. Despite humidity that just won’t go away, I made hot tea. Not just any tea, but the green tea anemone. 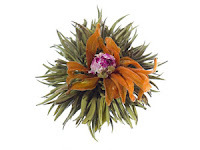 The anemone is the performance artist of green tea. Several leaves are bound together. Dry, it is a tight ball of tea leaves. Toss it into hot water and watch it perform. I guess it provides a moment for de-stressing, even a ritual. Not quite the ritual of a tea ceremony, but it was exactly what I needed. I prop my chin in my hands and watch the green tea anemone slowly float to the bottom of the tall glass and begin its unfolding, I smile through the moment. This thoughtful friend of mine gifted me special tea anemones because these have flower petals hidden inside! She found tea that mirrors the oils I create in my practice. The subtle healing properties of flowers combined with the herbal properties of green tea are likened to the combination of the subtle healing properties of essential oils and Chinese herbs in Elemental Oils. See, friends are great. Most people know me as a coffee aficionado, essentially pretty particular. If I’m going to have coffee I’m going to have a good cup of coffee as a real Americano or in a French press. If you stop by sometime you will notice I keep very small amounts of Alterra, Metropolis, Stumptown, or Intelligentsia around, but I have a massive collection of tea. A small portion of my stash comes from jet-setting friends as remembrances from travels to Israel, England, Scotland, Ireland, Holland, China, Japan, Russia, France, and Italy. (I remembered you all.) Most of my collection I order from Specialteas. I love their tea, especially the green tea. I can think of 15 varieties, but I know I have more. Yes, they all vary by the same characteristics that coffee and wine vary – taste, color, body, tannin or acidity. Some days I want a stronger fermented or malty taste, other days I want grassy crisp flavor, or maybe a sweeter floral jasmine or peony. Young soft sometimes fuzzy buds of leaves, and contains the most antioxidant properties. White tea is usually a great alternative for the caffeine sensitive or for whom tea is too drying. Mature leaves used in the majority of green tea varieties. We’ve got sencha, bancha, kukicha, genmaicha, and dragonwell to start with. My foray into tea began with pai mu tan (white peony). Sundays afternoons, a couple with whom I shared an Angelic Organics food share would sip white peony green tea and eat mung bean tea cakes while I divided out veggies. That was a long time ago. Intelligentsia used to carry a green earl grey – drinking that was like a 2 for 1! Partially fermented and therefore has more caffeine and a stronger flavor. I was told by a tea seller at a conference that no one loves all green teas; you either love oolong or you hate it. I just pursed my lips, nodded and walked on. As usual I don’t fit the supposed norm; I haven’t met a variety of green tea I didn’t like. There is no other green tea that you want aged. Aging is for wine but Pu’er tea is the exception. This one is fermented and aged and classified just like wines. Seriously robust and great for digestion (and hangovers). You know as well as I do that tea has antioxidant properties. Every magazine or television show has informed you over many years. Antioxidants assist the body in removing free radicals – those lovely molecules generated by cells of our body upon exposure to toxin, viruses, germs, fungi, stress, pollution, and chemicals. At first they are beneficial to us destroying unwanted invaders but everything is affected by imbalance. Free radicals begin to attack the cellular DNA which directs key cell activity, the body wards off attack with antioxidant defense – free radical scavengers. I could go on and tell you all that happens but essentially free radical damage is partially responsible for aging and disease. There are many aspects of nutrition that will help on the antioxidant front. I will only say so many times, “EAT MORE GREENS.” So instead drink a couple cups of tea daily, you will receive a mild to moderate caffeine boost and will get busy on the free radicals. www.stashtea.com now has powdered green tea. Look mom, no bags! This entry was posted in coffee, Nutrition:antioxidants, Tea. Bookmark the permalink. One Response to Friends are great, aren’t they?